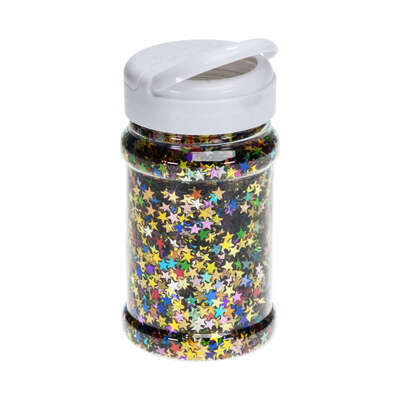 A unique and engaging addition to your Arts and Crafts resources, choose our Glitter Stars Multi Colours Shaker. This large, plastic pot comes with a resealable lid and ergonomic shape while inside an array of shimmering glitter star-shaped sequins twinkle through. Adhering perfectly with all glues and adhesives, these glitter stars can also be sprinkled on top of paints and used to decorate all manner of art works. Great for all ages and promising to bring a smile to every artists face, choose a unique alternative to traditional loose glitters and mould the perfect night sky in seconds.